Did you know that skin cancer is the most common type of cancer? You often only see warnings about wearing sunscreen in the spring and summer when the weather is warmer, making skin cancer an after-thought in the winter. But just because the winter months have set in doesn’t mean you no longer need protection from the sun. In the summer, it’s hot—you can almost feel the UV rays penetrating your skin, which is a good cue to apply sunscreen. In the winter it’s cold, there are more hours of darkness, and the time you spend on sunscreen application in the summer is likely going to be spent on layering your clothes and giving yourself extra time to combat the elements. But you need to know that it’s equally important to apply sunscreen in the winter. Regardless of what you’ve been told, the sun does not become less dangerous in the winter. The rays you feel in the summer are called UVB rays. These are shorter wavelengths that aren’t as strong in the winter due to the earth tilting away from the sun—but can still burn the skin from reflection or when people are in high altitudes. The ice and snow are a good reflector of the sun, in fact, the World Health Organization says that snow can reflect as much as 80% of UV radiation. Because there’s such a strong reflection, you need UV-protective sunglasses to shield your eyes as well as sunscreen to protect from skin cancer. UVA rays are still present. They have the longest wavelength, they penetrate deeper into your skin and they have the same impact year-round. A common misconception is that the biggest threat winter poses is windburn. However, windburn doesn’t come close to having the same adverse health effects as UV rays. But it does noticeably irritate the skin, so it’s no wonder it catches people’s attention in the winter more than the sun does. But what people often mistake for windburn could actually be the effects of sunburn. Even though the sun may not be beaming hot on your skin, UV rays still have the ability to penetrate clouds and cause sunburn. In 1936, an American physicist, William Henry Crew, and an English Doctor, Charles Howard White, set out to prove that windburn is a myth. They left skin exposed in a wind tunnel—removing the UV rays—and found that while goosebumps were present on the skin, the redness and chapping attributed to windburn were not. They concluded that redness and chapping are a result of UV exposure, not wind. Whether you’re of the opinion that windburn exists or that the burn is a result of the sun, sunscreen is the best protection in both cases. People’s skin becomes dry in the winter months, eliminating a protective barrier and making the skin more vulnerable. Sunscreen can help restore that barrier to provide the moisture and protection you need. 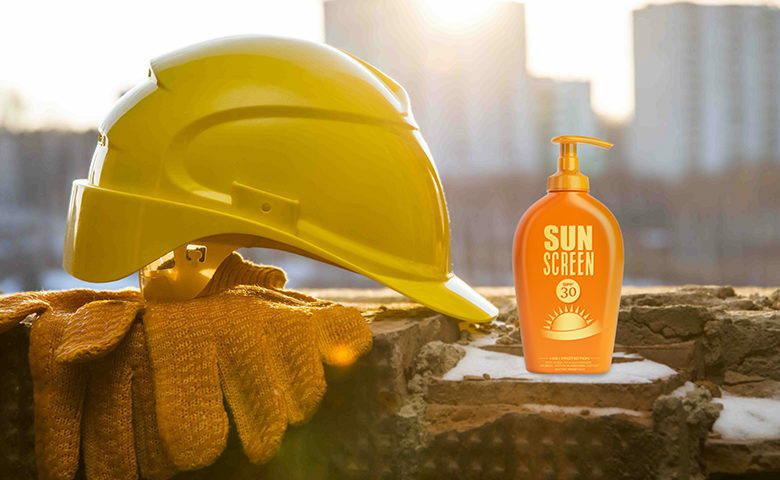 Applying sunscreen year-round will help with workers develop keystone habits, ultimately making them safer in every aspect of their day. Sunscreen should be regarded as an important part of their required PPE. A broad-spectrum sunscreen will protect against UVA and UVB rays. It will also provide moisture that is depleted in the cold, dry air to help prevent any burn (including those that feel like they’re windburn).